The following videos are a composite of GolfGym PowerSwing Trainer exercises that will help you to improve your golf swing muscles which will help you add more distance and accuracy. Consistent practice will bring about consistent golf swings which will bring about consistent golf shots. 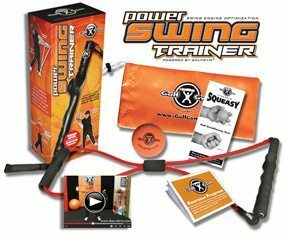 The GolfGym PowerSwing Trainer is a simple tool that will bring about great results when used regularly. The GolfGym PowerSwing Trainer is the most portable, economic and lightweight swing training unit on the market today. It can fit into your golf bag, your briefcase or traveling bag. It is designed to help you train the muscles used in the golf swing. We recommend your doing various exercises to improve your overall fitness levels. This will help with your flexibility, stability and mobility.